We’re coming back to Lafayette Village! Build Your Very Own Earth Bucket with KIN! Fall Vegetable Special – Grow your own broccoli, beets, carrots, and beans. All kids are welcome. JOIN KIN at Lafayette Village. 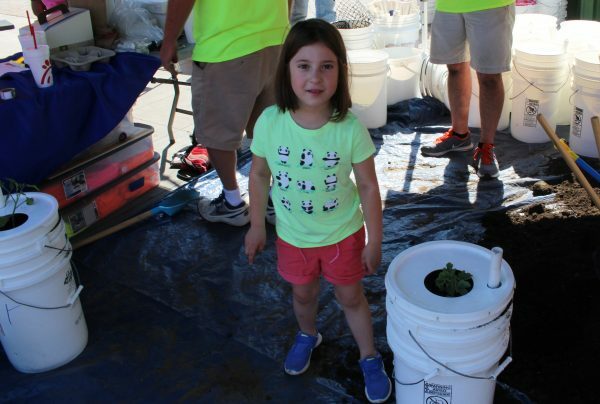 Kids can make, decorate, and plant a hearty fall vegetable seedling in an Earth Bucket to take home! Earth Buckets are self-watering, foolproof, space-saving alternatives to growing vegetables in a traditional garden. Earth Buckets require little attention, just water every couple of days and a few square feet of space in a sunlit area. The self-contained Earth Bucket provides all the water and nutrients your vegetable plant needs to thrive. No registration necessary – just show up, say “hi,” and dig in! Can’t make it, and you really want to build your own Earth Bucket? HERE’S how – BUILD YOUR OWN EARTH BUCKET.